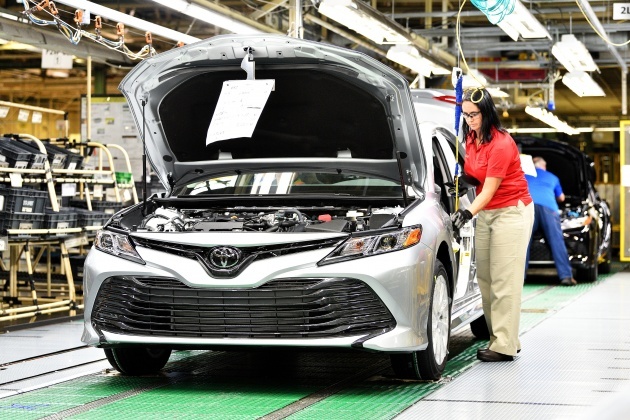 Toyota has started production of the 2018 Camry at its Toyota Motor Manufacturing, Kentucky (TMMK) plant in Georgetown. The eighth generation of the well-known nameplate was first unveiled at this year’s North American International Auto Show (NAIAS) in Detroit. According to the carmaker, the new Camry is the first vehicle in North America designed and manufactured with the Toyota New Global Architecture (TNGA). It claims the platform, which also underpins the latest Prius and C-HR, offers improved performance, better fuel economy, enhanced handling and a more comfortable ride. A striking new design gives the new Camry a sleeker look that makes it instantly recognizable from afar, while on the inside, the driver-focused cabin features plenty of premium and soft-touch materials. The forward-looking approach is still accompanied by plenty of NVH countermeasures to ensure an even more comfortable ride inside. “The launch of the next-generation Camry is important for Toyota in America, and expands the company’s footprint in and commitment to Kentucky. We are proud to be the first in North America to produce a vehicle with TNGA. It’s a testament to the skill and dedication of our team members,” said Wil James, president of TMMK. To facilitate production of the sedan, TMMK increased its workforce by more than 700 people, bringing the number of team numbers to a record 8,000. Toyota also invest US$1.33 billion at TMMK for TNGA improvements and other makeovers that will modernize and streamline the production process. Since it began operations, TMMK (the largest Toyota plant in the world) has produced more than 11 million vehicles in its 31 years, eight million of which are Camrys. 8000 workers produced 500,000 vehicles and 550,000 engines in 2016, good job !!! This car will sell like hot cake. The rear looks like the current Altis and the front looks terrible, it’s like a mixture of the current Mazda 6 and the current Camry = Lazy & Horrible effort from Toyota ! Design depend on personal preference, for me its good & doesn’t look too uncle as the previous version. I’m not a T fan,especially UMW Toyota but American design Camry is good enough, less ‘UNCLE’. Well this new Camry specs also that good, too bad UMW strips off a lot of it when it comes in our country. 1 thing for me its lag, is the turbo engine for better efficiency. Its not future proof. Unlike the accord, expected to use both 1.5l & 2.0l turbo for the next gen.
UMW stripping Camry too much? Bro. Camry 2.0 has 6 speed gearbox for several years already. Which cave r u living? Camry hybrid at 155k also has 7 airbags, ABS, VSC, lane assist, cross lane alert. Also 2-3 years. You consider yourself a car fan, but you are so outdated. So smart ? U do the design la.. In the US, Camry is a budget car for fresh grads, selling for only 25,000 USD. Back in Malaysia, it’s a “luxury” cars only affordable to the retirees. Malaysians only can afford No VSC cars like Axia, Alza, Bezza and Myvi plus Saga. In trumpland, any college degree is worth the price of a house. And thats just local community college, not even Ivy League level. U want us to have cheap cars but no degree or current status? Improved performance, better fuel economy, enhanced handling and a more comfortable ride. UMW Camry. Don’t get too excited. Wait for the asianed version of camry that will looks like ‘uncle’ and when it comes to Malaysia, UMW with stripped off some safety feautures and overpriced it. Asian Camry is not Camry. Its Aurion. Aurion is the name of Asian Camry for Australia market. Asian Camry known as Daihatsu Altis. Toyota Japan mentioned no more separate Camry models like before (Japan, Asian, Australian, usa). Come on UMWT, wake up from your deep sleep. See Honda is eating your market share day by day. This US face Camry looks good IMO especially the top end one. I hope they’ll bring this US face to our market not the uncle super god of chrome camry here.1 more thing, please don’t stingy with the spec. I’m sure more younger buyer would like to buy it rather than uncle apek only. UMW is selling 300k cars per year. Nothing for u to worry. 80k by umwt and Lexus, and the rest by perodua. Don’t be stupid. 60k workers 72k cars produced. Who is it? Camry 2.5 hybrid already VSC. 7 airbags. 155k. Why so lazy and stupid before commenting make sure your brain is switched ON. Still look as uncle car as before. But this time round, it’s Uncle Ah Beng styling philosophy with all the cosmetic add ons. Lazy effort by Toyota as always. The new Proton Perdana also don’t have VSC.